Got Any Old Shoes? Baby Carson Could Use Some! From now until Friday, August 9th we will have a box in our Marketing Department for collecting any type of shoes to help the family of one of our customers, Western Exterminator, whose grandson is battling Kawasaki Disease. 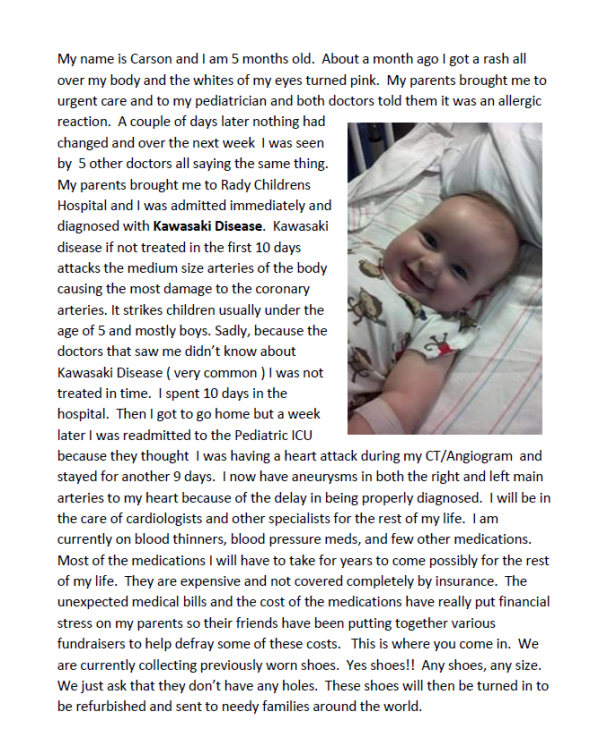 Kawasaki Disease attacks the coronary arteries and treatments are very expensive--$200 per week. In order to buy his medication his grandmother is organizing a shoe donation drive. If any of you have shoes that you could donate, it would mean so much to the family and to us. Any type of shoes (men, women & children) will be gratefully accepted, as long as they have no holes or serious damage. If you have some free time, please look through your closets for shoes you no longer want or wear. It would mean so much to the family and this little boy Carson who needs this medication to survive. If you can donate some shoes to help this beautiful little baby, we would be so appreciative!